Review by Mark Rashap, Spec’s Central Texas Wine Educator. Mark can be reached at MarkRashap@specsonline.com. Alessio Carli (winemaker) who has degrees in Agronomy and Enology and was assistant winemaker at Badia a Coltibuono in Chianti. Since 1990, he has worked in California as consultant and winemaker. In 1998 with eight years experience in California, Alessio joined Pietra Santa, where he helped design the new winery, oversees farming, and makes the wines and olive oils produced in this unique area of the Central Coast. 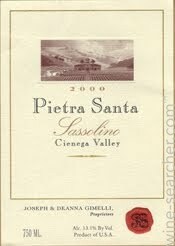 The Pietra Santa estate (Italian for Sacred Stone), located in the Cienega Valley AVA in the Gabilan Mountains near Mt. Harlan AVA, both of which are sub-AVAs of the large Central Coast AVA. 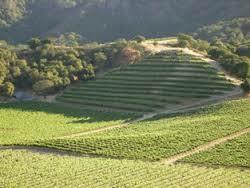 The estate’s location on the San Andreas Fault offers an unusual mix of both limestone-based and granite-based soils. First developed in the 1850s, the Pietra Santa estate is just 25 miles east of the Monterey Bay. Due to the rugged terrain, only 120 acres of the 450 acre property are planted to vines with an additional 25 acres planted to olive trees. In the 1980s, the area was redeveloped with replanting to better match the varieties grown with the various soils and exposures. Pinot Grigio and Chardonnay are on steep east facing hillsides that receive morning sun and afternoon shade. Pinot Noir and Sangiovese are on a sloping bench land. Zinfandel, Cabernet Sauvignon, and Merlot are grown on the warmer valley floor. A 14.5% alcohol blend of 70% Sangiovese and 30% Cabernet Sauvignon aged 24 months in barrel. This wine shows intense black cherry with tons of savory spice and black tea leaf. There is a hint of vanilla from the barrel ageing, which has not yet fully integrated but is quite pleasant. The wine is medium bodied with velvety tannin and the brilliant acidity that Sangiovese is known for. It has a bit more fruit and less spice and floral notes than say your Rosso di Montalcino. However, I was lucky enough to recently have tasted a 2006 Sangiovese from this winery, and I was shocked to see how delicious the evolution was. It was still young, but the spice and floral components truly shined and the acidity could carry the wine another 5 years easy. Mark’sMark: 90. Good Review. I will probably buy some for tonight.